Fits any smartphone (even with a case on) including the iPhone 6 plus, 6, 5S, 5C, 5, 4S, 4, 3GS, 3G, Samsung Galaxy S6, S5, S4, S3, S2, Note, Note 2, Note 3, Nexus S, HTC One X, S, Motorola Droid Razr HD, Maxx, Nokia Lumia 920, and LG Optimus G. Also fits analog things like a notebook and pen. Use your bike share apps or GPS. 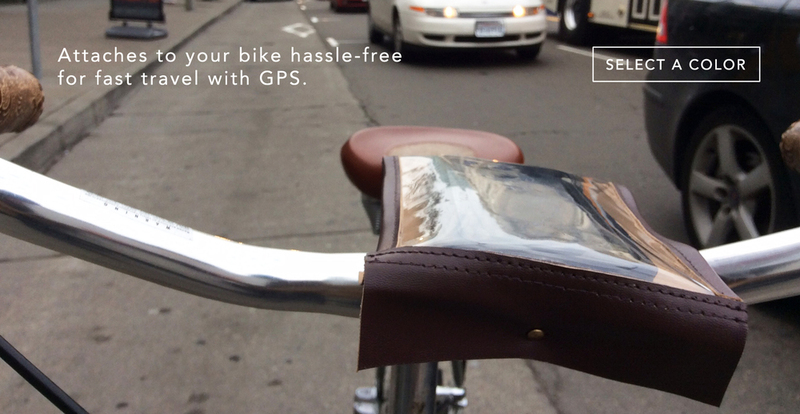 This holder lets you travel on your bike with more convenience: safely accessing GPS, your timer, and dock/bike availability and locations, without stopping mid-route to pull out your phone. Use GPS if you're cycling in a new place. If you're using bike share: you can access dock availability before arriving at a dock, and clock your rides to avoid paying late fees. It's 100% compatible with New York's Citibike, Chicago's Divvy, Washington D.C.'s Capitol Bike Share, Boston's Hubway, Bike Chattanooga, San Francisco's Bay Area Bike Share, Melbourne Bike Share, London's Barclays Cycle Hire, Bixi Montreal, Nice Ride Minnesota, Bixi Toronto, CoGo, and more. It also works on any bike. Read more on how other customers are using it.